Tonight, we see the legendary free jazz player Ornette Coleman at Massey Hall. His warm reception was a delightful change from all those years of being a scourge to the jazz world. In fact, this thunderous applause he was receiving for every song reminded me of the opening of Shirley Clarke's impressive documentary of the man. The film opens in the present tense with his band Prime Time (which adapted his theories to jazz fusion)- and it is ironically amusing seeing him play before a black-tie crowd in his native Texas. Yes, Coleman has come home again.... and to open arms, however this warm greeting was hard won. In Coleman's own words, the sudden appreciation of his work is this: "I guess if you live long enough, you get to be an elder statesman." 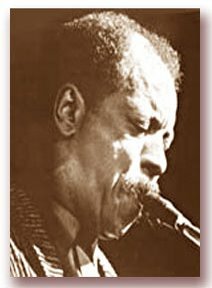 40 years on, the jury is still out on Ornette Coleman. His "harmolodic" theory was/is one of the foundations of the free jazz movement. His original quartet (with Don Cherry, Charlie Haden and Billy Higgins) was the scourge of the jazz world in the late 1950's... and even today the revolutionary sax player is still a hot topic for debate. The beauty of ORNETTE: MADE IN AMERICA is that it doesn't try to change one's mind about him. It is however a fascinating study of a figure who really sacrificed a lot for his unique voice. It is enough to see Coleman practice his music in one of the most unholy places in Urbana (an abandoned building often populated by addicts and knife-wielding crazies)- fittingly working on outlaw music among other societal outcasts. However, this film pushes Ornette's legacy even further-- he often comes across as some kind of pop icon or superhero (as best exemplified by the cartoonish image of his likeness flying across a starry backdrop)- while he may be more mainstream than ever, this silly bit pushes it a little too far. Sadly, ORNETTE MADE IN America is not widely available. My one and only screening of this in 2001 at Toronto's Cinematheque was made available by a film print which came and went under the arm of someone from New York the same day. It is a revealing, complex and somewhat moving portrait of a person who stands by his art regardless of its interpretation. 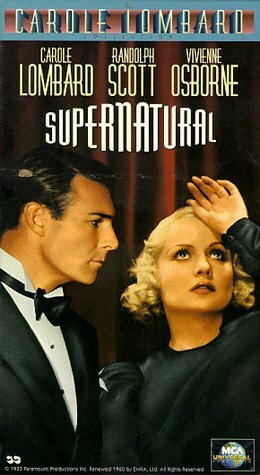 Here is a real treat- Carole Lombard, best known for her comedy roles like NOTHING SACRED, MY MAN GODFREY and TO BE OR NOT TO BE, has an early and unconventional role in this underrated thriller made by the brothers Halperin (Victor and Edward) after their surprise hit WHITE ZOMBIE (a great public domain favourite that still enchants us today). Thus, once they were called to the Paramount backlot, they made what is probably their most polished piece of work in a technical standpoint. Perhaps it lacks that unique mood and atmosphere of their earlier feature, but this entertaining piece of B movie chiller conventions is very well done. 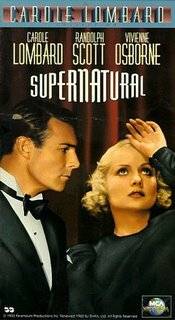 Carole Lombard sees a phony spiritualist who claims that he can contact her dead brother... and even offers up the notion that the young man was murdered! Thus, complications evolve from this twist, naturally, and the result is a very entertaining 65 minutes, which has a marvelous ending. This is one of those horror movies that acts rather ambigiously about its supernatural quotient- rather, it plays like a melodrama and mystery with vaguely otherworldly elements. In this case, it works better, because we're never sure if some peculiar moments are due to outside forces or just weird coincidences. Also fun to see Randolph Scott as the love interest, when he had not yet found his cowboy image.